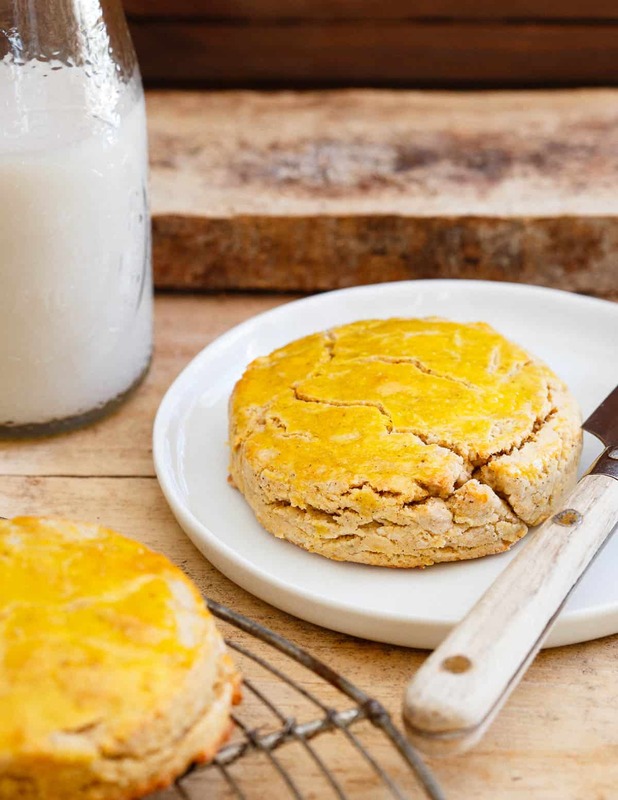 These butternut squash biscuits are full of vanilla flavor with a crispy, flaky outside and soft, buttery inside. Even better, they’re paleo! Tomorrow is our 10th wedding anniversary. 1-0. I vividly remember thinking on our wedding day that I’d be 34 when we hit the ten year mark and man, did that seem so far away and so old back then. Ha! We were headed to Tahiti for our honeymoon 48 hours later and somewhere along the way on that 12 hour plane ride we talked about where we’d go for our ten year anniversary. Would we love Tahiti so much we’d come back? Go to New Zealand or Australia (the runner-up honeymoon locations) instead? Or, hit up some other exotic place somewhere in this world? *This post is sponsored by Vital Proteins. Not exactly that exotic worldly trip I had imagined. But, 10 years ago I also never would’ve imagined my husband as a police officer or me as a food blogger with the all the travel opportunities I’ve had and have coming up either. Funny how things work out. So, upstate we go to a small town about 2 hours north of where we live that bizarrely, neither of us have ever visited. The next day, we’re rafting down the Hudson River for 8 hours but I fully intend on spending tomorrow in quaint little stores, bouncing between bakeries, coffee shops and other cutesy places where things like these vanilla butternut squash biscuits would be served. Paleo baking can be tricky. I seem to have gotten the bread thing down but things like biscuits definitely aren’t easy when you’re dealing with coconut flour, almond flour, tapioca starch and the like. I recently saw Bob’s Red Mill paleo baking flour, glanced at the ingredients to see they were everything I’d normally use in a paleo baked good and figured, hey, I’ll give it a shot, betting their ratios were on point. 13 minutes or so later, out of the oven they came all cracked and flaky on the outside, soft and moist on the inside like a biscuit should be and I was sold. The even better part is these aren’t just normal biscuits. Besides their fall spin with butternut squash hiding out in there, I used Vital Proteins vanilla-coconut collagen whey for an added protein and health boost. Like many of their amazing products, this whey is grass fed and pasture raised and more importantly, tastes amazing. I’ve become that person at the gym with my shaker bottle full of protein powder and carbs every day over the last year since getting on the macro and nutrient timing train. When you’re eating/drinking something every single day, quality matters. Grass-fed, pasture-raised protein was never something up for debate and this one has quickly become one of my favorites. With all the muscle building and athletic performance components of quality protein powder, it also has the joint health benefits of collagen, something you don’t see in most protein powders. 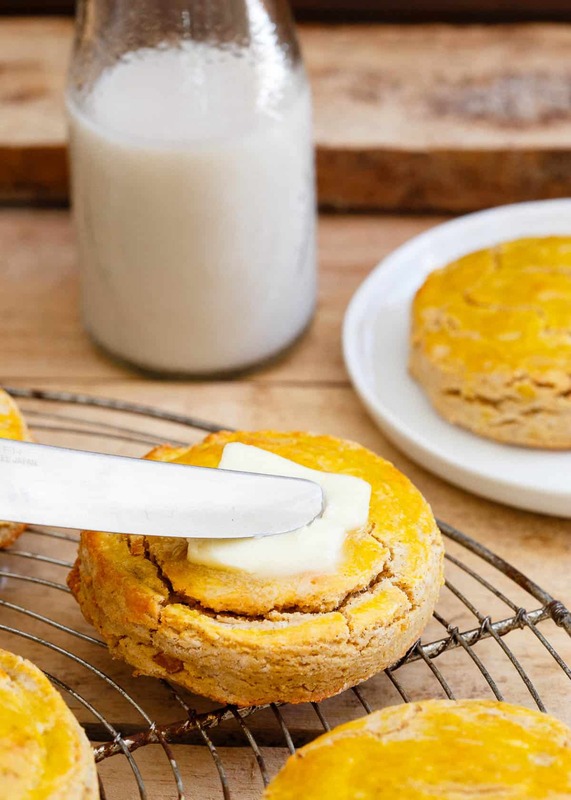 And while delicious on its own, it makes an excellent addition to baked goods like these butternut squash biscuits. 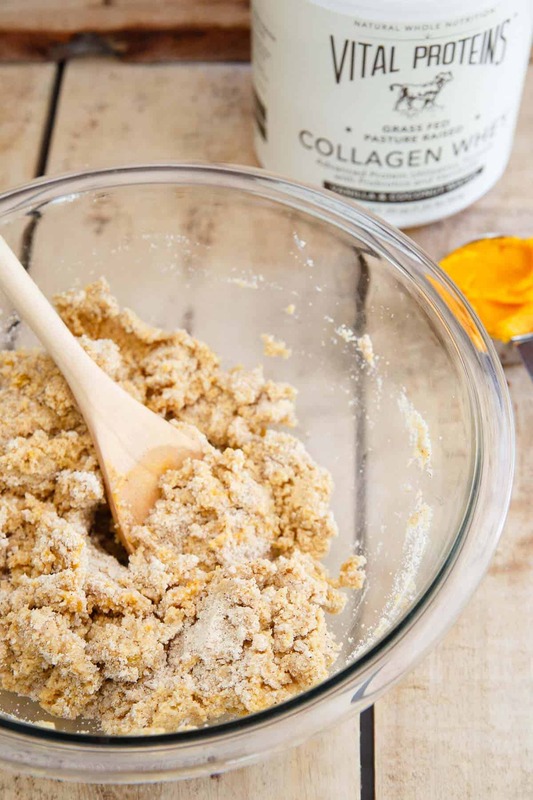 The vanilla bean paste highlights the vanilla in the collagen whey and goes perfectly with the butternut squash and fall spices all packed into each one of these grain and gluten free bites. Serve them warm with a pat of high quality grass-fed butter and they’re the ultimate fall breakfast, snack or even dessert! 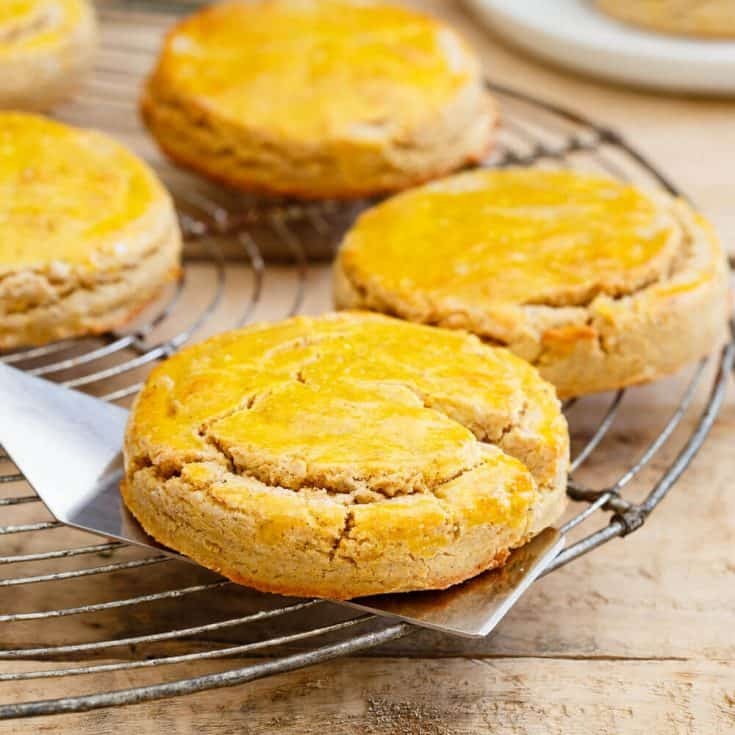 These butternut squash biscuits are full of vanilla flavor with a crispy, flaky outside and soft, buttery inside. Even better, they're paleo friendly! Preheat oven to 400 degrees and line baking sheet with silicone mat or parchment paper. Combine flour, protein powder, baking powder, salt, cinnamon, ginger and cloves in a large bowl. Add butter and cut in with a fork, pastry cutter or your fingers until broken up into little pieces and the mixture is the texture of coarse meal. Whisk together butternut squash puree, 1/3 cup milk, vanilla bean paste and maple syrup in a small bowl. Add the wet ingredients to the dry and mix until just combined with a spatula. Turn the dough out onto a floured surface and shape into a disc about 1 inch thick. Cut out circles using a biscuit cutter or other circular cut out (I used the lid of a mason jar) and place each biscuit on the baking sheet. Reshape any excess dough and continue cutting into biscuits until all the dough is used up. Place the egg yolk and remaining 1/2 tablespoon of milk in a small bowl and gently beat together. 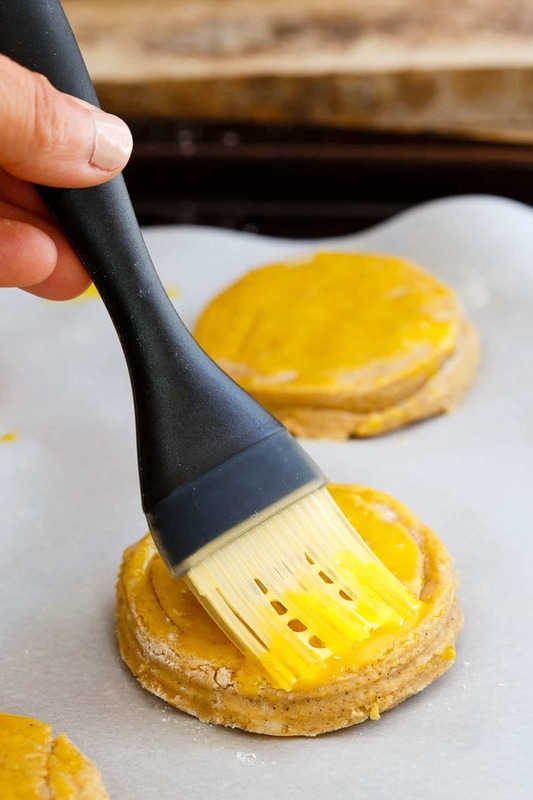 Brush the tops of each biscuit with the egg wash.
Place the baking sheet in the oven for 12-14 minutes until edges start to turn golden brown. Make the butternut squash puree by steaming or boiling cubed butternut squash until fork tender. Drain well and process in a food processor until smooth. Happy Anniversary! Sometimes the little mini trips close to home can be the most fun. No airport hassle and a quick drive. I love these fall biscuits! I had no idea Bob’s Red Mill made a paleo baking mix, I’ll have to look for that. Of course I love the Vital Proteins added in, it’s crazy how many things I just add a scoop or two of it to. Have a fun weekend! I love all things butternut squash, and these look so good! Plus I love that they are packed with nutrition! And these biscuits are SO fall, I can’t wait to try them! Pinned! Oh, my, goodness. These biscuits look amazing. Happy Anniversary, too! These biscuits look delicious! I absolutely love biscuits, especially hot out of the oven! So amazing. I could not believe that these biscuits made by person who is not an expert. Thanks for sharing! Happy anniversary and Saratoga ain’t got nothin’ on Tahiti. 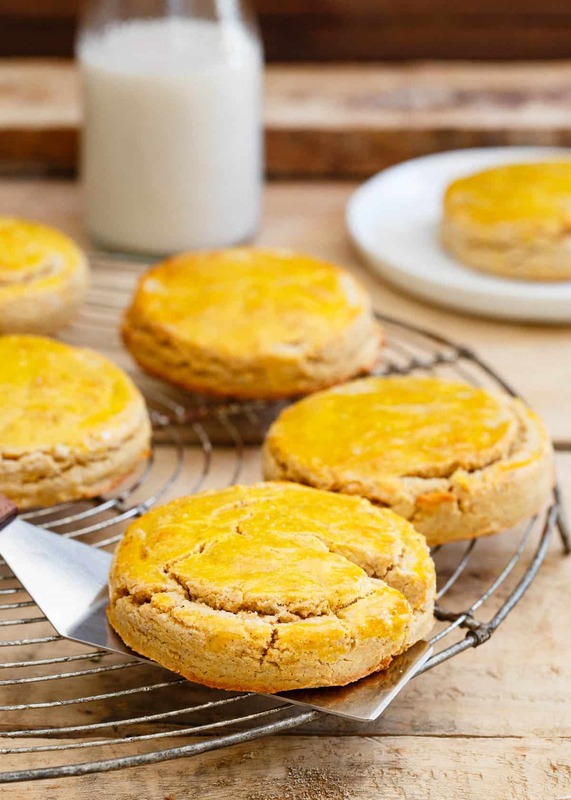 These biscuits are fall-perfection. Happy anniversary! Hey, you don’t have to go anywhere crazy to have an awesome vacation! Love love love these biscuits. Gorgeous photos.